نشست تحکیمی یکی از مشکلات اصلی ژئوتکنیکی در مناطق با لایه های ریزدانه اشباع می باشد. ارزیابی این پدیده با حفاری گمانه، تهیه نمونه های دست نخورده، تعیین خصوصیات ژئوتکنیکی خاک و انجام آزمایش تحکیم انجام می شود. بدلیل هزینه و زمان قابل توجه مخصوصا" در مناطق وسیع معمولا متاسفانه موضوع نشست تحکیم به طور کافی مطالعه نشده و در نتیجه آسیب ها و خسارتهای عمده در پروژه های عمرانی ناشی از بروز این پدیده بوجود می آید. انواع لایه های رسی و مارنی در قسمتهای مختلف شهر تبریز گسترش یافته است. در منطقه ای بنام کوی فرشته شمالی (واقع در شمال شرقی شهر) این لایه های رسی سیلتی در معرض مسیر زهکشی آبهای زیر سطحی ارتفاعات شمالی شهر تبریز قرار گرفته و از پتانسیل نشست تحکیمی قابل توجه برخوردار می باشند. تعداد قابل توجهی از ساختمانهای مسکونی اجرا شده در این منطقه در سالهای گذشته دچار آسیبهای جدی شده اند. در این تحقیق با حفاری گمانه های ماشینی و دستی در محدوده مذکور آزمایشات کامل فیزیکی، خمیری، مقاومتی و تحکیم بر روی نمونه های تهیه شده برنامه ریزی و انجام گردید. پس از بررسی ژئوتکنیکی لایه های محل تحقیق، مقاومت باربری مجاز پی های نواری سازه های موجود بر اساس معیارهای گسیختگی هنسن، نفوذ استاندارد و نشست تحکیم در حالتهای مختلف عرض پی و نسبت طول به عرض پی ها محاسبه گردید. براساس نتایج این تحقیق، معیار نشست تحکیمی مقاومت مجاز پی ها را تعیین می کند. بر این اساس مقاومت مجاز پی های سطحی برای سازه های معمول در این منطقه کافی نمی باشد. انجام مطالعات ژئوتکنیکی کافی و استفاده از پی های عمیق توصیه و پیشنهاد می گردد. -Prasad S. K. (2018) Foundation Settlement. College of Engineering, Mysore sjce.ac.in/wp-content/uploads. - National Bureau of Standards, Department of Housing and Urban Development (2013) National Building Regulations - Seventh part. Ministry of Roads and Urban Development Islamic republic of Iran (in persian). - Sadrekarimi J., Zekri A. (2006) Creeping behavior of fine-grained soils based on visco-elastic models. 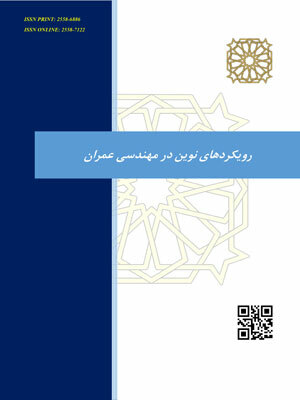 Journal of Engineering Faculty of Tabriz,Vol.33, No.3. (in persian). -Hooshmand A., Aminfar M. H., Asghari E., Ahmadi H., (2012) Mechanical and Physical Characterization of Tabriz Ma, Iran. Geotechnical Geology Engineering, Vol.30, pp219-232. -Sadrekarimi J., Akbarzad M.(2009) Comparative Study of Methods of Determination of Coefficient of Subgrade Reaction. EJGE. - Ghobadi M. H., Babazadeh R. Mousivand M.(2012) Engineering geological investigations along the Tabriz subway extension focusing on ground surface settlement, northwestern Iran. Journal of Engineering Geology, Vol.6, No.2. - Shaaban F., Ismail A. Massoud U., Mesbah H., Lethy A., Mohamed A. (2013) Geotechnical assessment of ground conditions around a tilted building in Cairo–Egypt using geophysical approaches. Journal of the Association of Arab Universities for Basic and Applied Sciences. - Burland J. B., Jamiolkowski M. B, Viggiani C. (2009) Leaning Tower of Pisa: Behavior after Stabilization Operations. International Journal of Geoengineering Case Histories ©, Vol. 1, Issue 3, p. 156. - Ovando E , Alexandra Ossa S., Romo M. P.(2007) The sinking of Mexico City: Its effects on soil properties and seismic response. Soil Dynamics and Earthquake Engineering 27. 333–343. - American Society for Testing and Materials, ASTM D1586−11 (2014) Standard Test Method for Standard Penetration Test (SPT) and Split-Barrel Sampling of Soils West Conshohocken, PA, USA. - American Society for Testing and Materials. ASTM D 422-63(2007). Standard test method for particle size analysis of soils. West Conshohocken, PA, USA. - American Society for Testing and Materials. ASTM D 854(2014). Standard test method for specific gravity of solids by water pycnometer. West Conshohocken, PA, USA. -American Society for Testing and Materials. ASTM D 2216(1998). Standard test method for laboratory determination of water (moisture) content of soil and rock by mass. West Conshohocken, PA, USA. - American Society for Testing and Materials. ASTM D 4318-93(2004). Standard test method for liquid limit, plastic limit and plasticity index of soils. West Conshohocken, PA, USA. - American Society for Testing and Materials. ASTM D3080 (2008). Standard test method for Direct Shear strength. West Conshohocken, PA, USA. - American Society for Testing and Materials. ASTM D 2435-03(2011). Standard test method for one-dimensional consolidation properties of soils using incremental loading. West Conshohocken, PA, USA. - American Society for Testing and Materials. ASTM D 2487-93(2011). Standard classification of soils for engineering purposes (unified soil classification system). West Conshohocken, PA, USA. - Bowles J.E. (1995) Foundation Analysis and Design. MC Grow Hill.